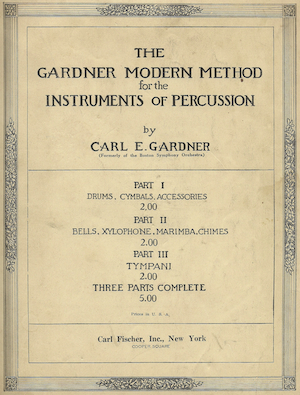 Carl Edward Gardner's Modern Method for the Instruments of Percussion was one of many influential percussion method books to come out of Boston around the turn of the 20th century including Harry Bower's Imperial Method for the Drum (1898), The Harry A. Bower System in three parts for the Drums, Bells, Xylophone, and Timpani (1911), and the Dodge Drum School (1909) which was later edited by Gardner himself. From the 1927 edition of the Gardner's Method comes this pretty awesome series of photos showing a man, perhaps Gardner himself, demonstrating playing techniques using a shiny new George B. Stone & Son Master-Model snare drum and later at the helm of a complete Stone drum outfit. 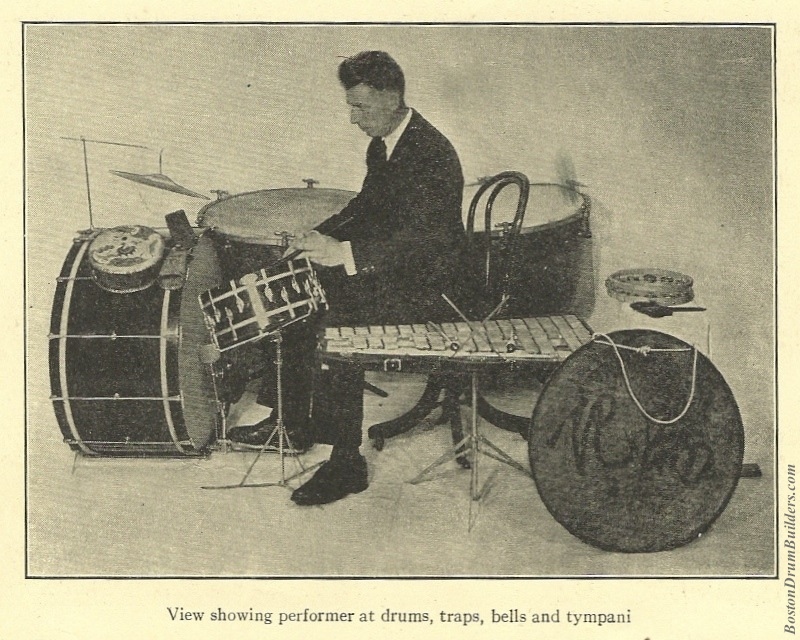 The earlier 1919 edition of Gardner's Modern Method includes photos of a different man behind an earlier set of drums including a single tension snare drum the maker of which is unclear. Note that in the picture of the full drumset that there is no hi-hat to be found, only a single cymbal attached to the bass drum hoop which was struck by a small metal beater attached to the bass drum pedal. The drumset as we know it was still evolving at the time of this photo, presumably circa mid to late 1920s. The type of George Stone outfit pictured would have represented the top of the line set up for a theater orchestra drummer of the day.